WHILE British-based riders face being asked to take pay cuts, fabulous financial deals are reported to have been offered to top names in Poland. The earnings of World No.3 Jason Crump are set to rival World Champion Tomasz Gollob, the highest paid rider in the 2010 Polish Ekstraliga on a record £620,000, according to reports in the Polish media. Crump is said to be about to change his club Wroclaw and move to Rzeszow where he is expected to be paid a similar amount to Gollob for the new season. The Polish reports reveal that Crump deal is for about £620,000 for the new season. It was negotiated by Crump and it can be extremely beneficial to him, provided he can score what is expected of him and he rides in as many matches as he did in 2010. Crump's signature on the contract is reportedly worth around £170,000 and every time he turns up for a league match he is to be guaranteed �3,000. If he rides in 20 Polish meetings that makes a round sum of £60,000 for the new season. The rest is to be earned on the track. For each point scored he will get £1,700 If he scores as many points as he did in 2010 he will take home about £390,000. Barry Briggs, four times World Champion, says: 'I wouldn't want to change a thing in my racing Life. When I was first at Wimbledon, bus drivers got a £2 a week and I think we could earn £30 a meeting. I met (football's) Ron Atkinson a few weeks ago and he told me he presented me with a cheque for winning something at Oxford for £300. He was a player there and was getting £20 a week. Roman Chyla explains the Polish set-up like this: 'For the last two years Polish speedway club bosses have been saying that they have reached the limit of what they can pay to riders. 'But come November/December each year they forget that their money supply is not a bottomless pit, and they start to bid. The riders' pay demands for 2011 season are going up sharply. Even though it will not be seen in the signed contracts, it will be reflected in the so-called bonuses, or individual contracts with sponsors who support the clubs. 'Riders' earnings will increase, for three reasons. Speedway in Poland is largely financed by the local governments. We have been going through the local elections recently, and the speedway cities' mayors have done everything to gain favour with voters. 'In Bydgoszcz the mayor sat next to Emil Sayfutdinov who in the glare of publicity re-signed his contract with Bydgoszcz, even though the team has been relegated to the lower division. In Zielona Gora, a candidate for the city council sought reinforcements, even trying to tempt such aces as Jason Crump and Tomasz Gollob. 'Finally, for a lot of money, Andreas Jonsson was signed for £433,000 and Jonas Davidsson for £200,000. 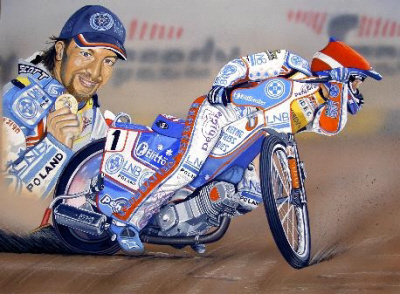 Yet for a lot less money they could retain Fredrik Lindgren (£222,000), and Grzegorz Zengota for £133 000. 'Another reason which spiralled the cost is a new rule forcing teams to include two Polish under-21 juniors who quickly scented the possibility of an extra income. Polish media are quoting that their two top under-21 stars, Maciej Janowski and Przemyslaw Pawlicki have asked for nearly £89,000 for their signatures and a minimum of nearly £900 per point. 'They could do it, because demand for their services has increased. For the same reason Gniezno in the Division One of Polish League are asking nearly £67 000 for talented Kacper Gomolski. The amount is staggering, but there is no shortage of volunteers. 'For the time being, Rzeszow or Zielona say they will not pay, but when they find a gap in their line-ups, they may change their minds. 'The third reason for the increase in wages is a new ruling that re-introduced riders' CMA. The point is that the total of six riders' CMA in each team in the Ekstra League must be within the range of 34 - 44. 'If some team has two or three riders with high CMAs, they have to employ less skilled riders, who are aware of this. Although they might be the also-rans, they surely know how to count the money. "Don't know where some of the guys were riding, in my day, it was £1 a start, and £1 a point!" "How would Arnie Pander & Ronnie Genz have ridden if they were paid a collosal amount of money. If they took home £30 for an evenings riding they were lucky."